Having continued to hold Biafrans in detention basically for their religious affiliation with Israel, the Indigenous People of Biafra believes it the responsibility of Israel and the custodians of the Judaic faith to rise to the occasion and rescue innocent Biafrans from the suppression being suffered in the hands of the Nigerian government. “Since President Trump announced US recognition of Jerusalem as the eternal capital of Israel, the wave of arbitrary arrests and persecution of Biafrans that practice Judaism in Aba and Igweocha (Port Harcourt) have dramatically increased. “Nigerian Government, by towing this path, is setting a very ugly and dangerous precedent. Those arrested for their faith must be released immediately including all those illegally detained for expressing their legitimately held views that they are better off in Biafra than Nigeria. “We want to bring it to the notice of the entire world what IPOB in particular and Biafrans are suffering in general at the hands of this Buhari administration. The world must therefore prevail upon Nigeria to desist from this blatant religious persecution and release those in their custody. 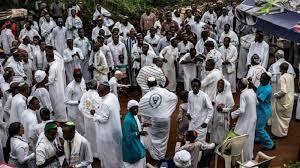 “Members of the Shalom Synagogue of Israel in Aba did not commit any crime known to law. They are a spiritual congregation merely being persecuted for their spiritual connection to the holy land of Israel.